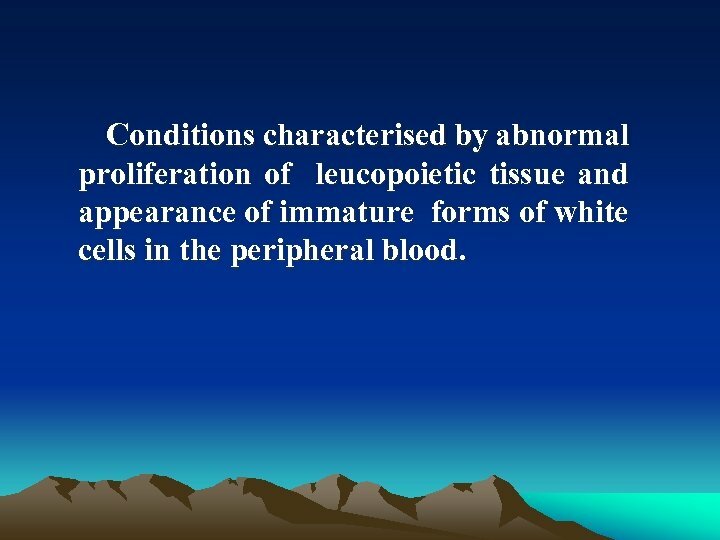 Conditions characterised by abnormal proliferation of leucopoietic tissue and appearance of immature forms of white cells in the peripheral blood. 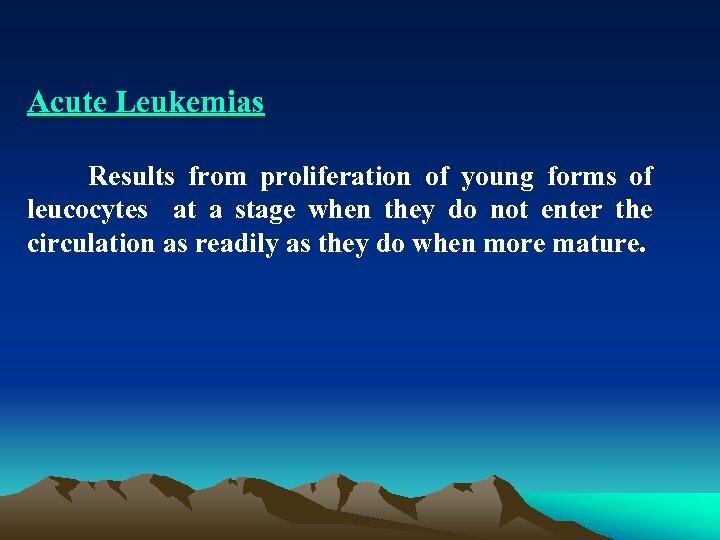 Acute Leukemias Results from proliferation of young forms of leucocytes at a stage when they do not enter the circulation as readily as they do when more mature. 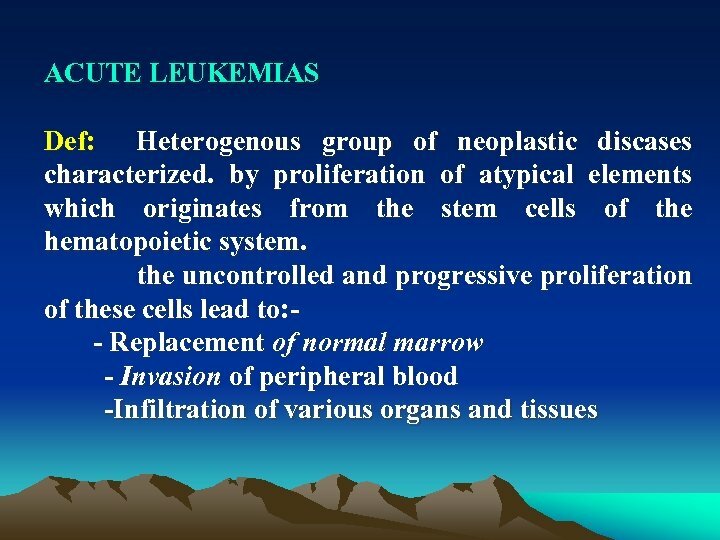 Classification: * acute lymphoblastic L. > more common * acute myeloblastic L. * acute monocytic L.
Etiology: Unknown, some factors seem to be implicated: A Environmental factors: • Ionizing radiation; mainly AML but ALL less important • Chemical substances; prolonged exposure to certain substances (benzene, phenylbutazone, chloramphenicol, anticancer drugs, alkylating agents, natulan) > incidence of leukemia mainly AML Onset often preceeded by a state of bone marrow hypoplasia, peripheral pancytopenia (preleukemic syndrome). B Genetic: May act by facilitating envirnomental factors. 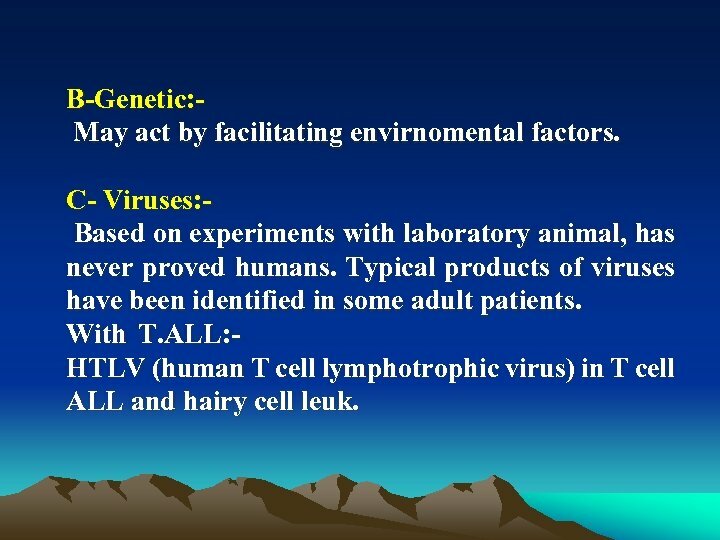 C Viruses: Based on experiments with laboratory animal, has never proved humans. Typical products of viruses have been identified in some adult patients. With T. ALL: HTLV (human T cell lymphotrophic virus) in T cell ALL and hairy cell leuk. 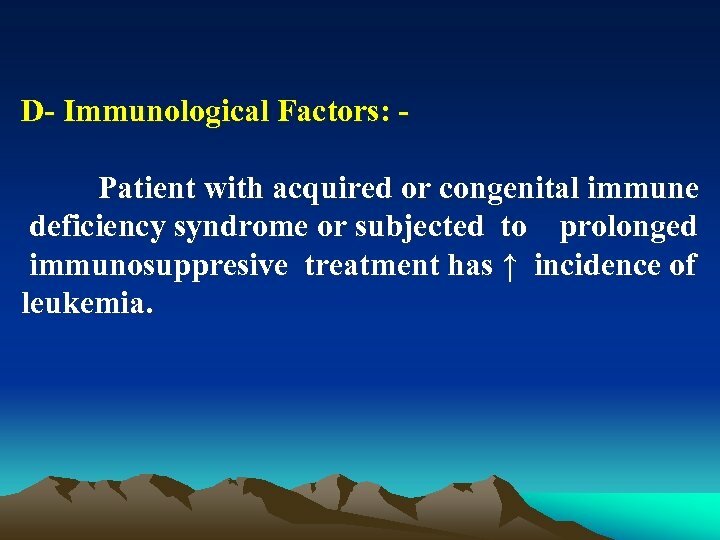 D Immunological Factors: Patient with acquired or congenital immune deficiency syndrome or subjected to prolonged immunosuppresive treatment has ↑ incidence of leukemia. 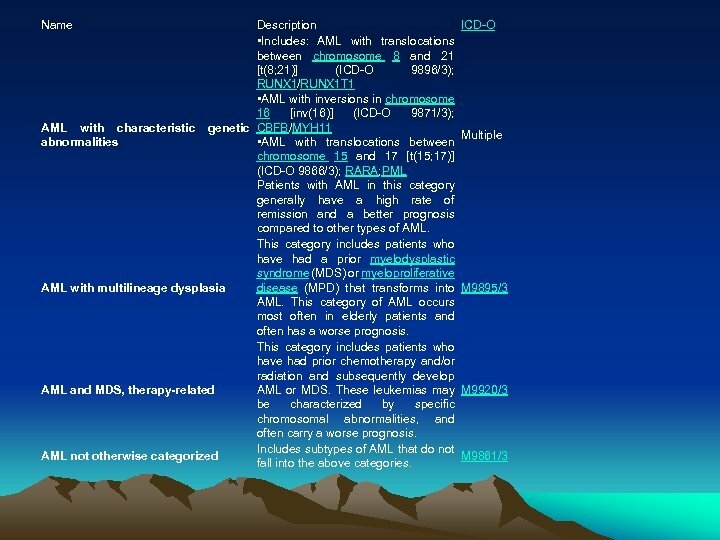 Differential Diagnosis : D. D. between various forms of acute leukemia is mainly on cytomorphologic, cytochemical criteria rather than on clinical data, which are often superimposable. age: may accur at any age but in general: A. L. L > the peak incidence in 1 st 6 years of life. 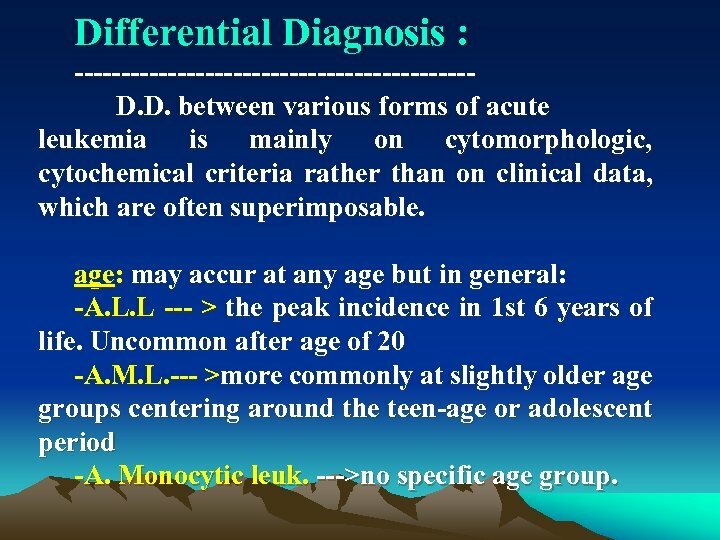 Uncommon after age of 20 A. M. L. >more commonly at slightly older age groups centering around the teen age or adolescent period A. Monocytic leuk. >no specific age group. Clinical Picture 1 Fever: moderate or high grade, usually irregular and shoots up when 2 ry infection occur 2 rapidly developing marked asthenia. 3 rapidly developing severe anaemia > marked pallor. 4 severe bone ache allover the body 5 Severe sore throat 6 bleeding tendency from > > gums. > skin > orifices >int. organs. 7 tender bones 8 joint pain (bleeding & infiltration) 9 L. N. enlargement in > > A. L. L. >A. M. L. >A. 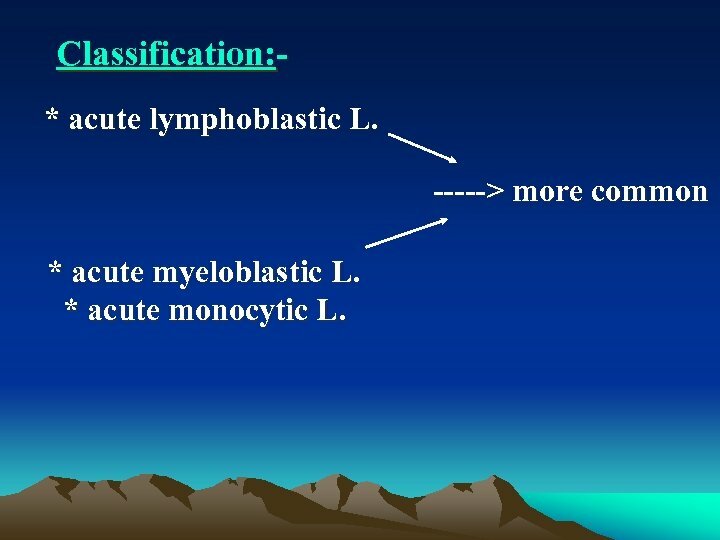 Monocytic L. 10 spleen & Liver enlargement. 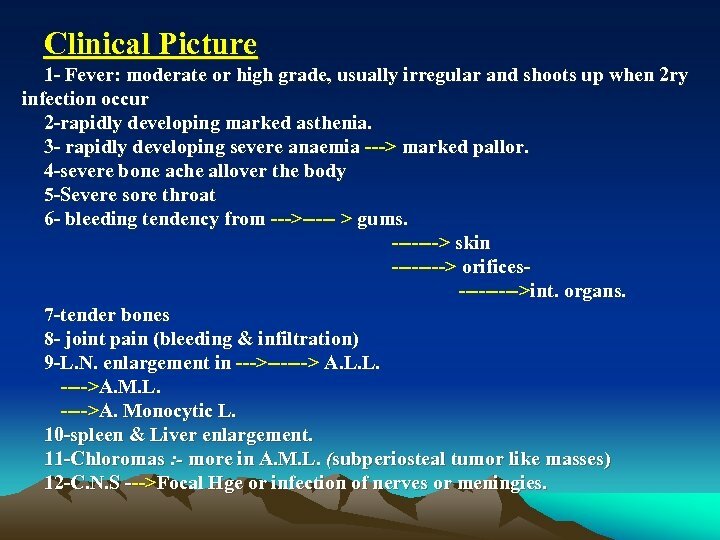 11 Chloromas : - more in A. M. L. (subperiosteal tumor like masses) 12 C. N. S >Focal Hge or infection of nerves or meningies. 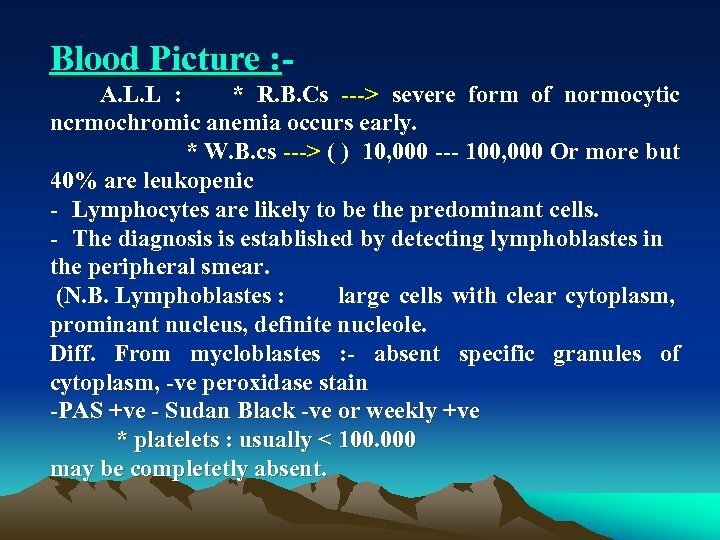 Blood Picture : A. L. L : * R. B. Cs > severe form of normocytic ncrmochromic anemia occurs early. 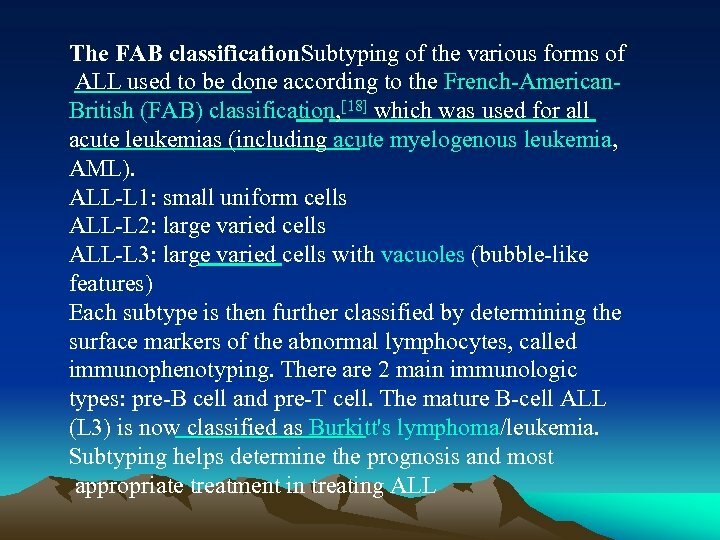 * W. B. cs > ( ) 10, 000 100, 000 Or more but 40% are leukopenic Lymphocytes are likely to be the predominant cells. 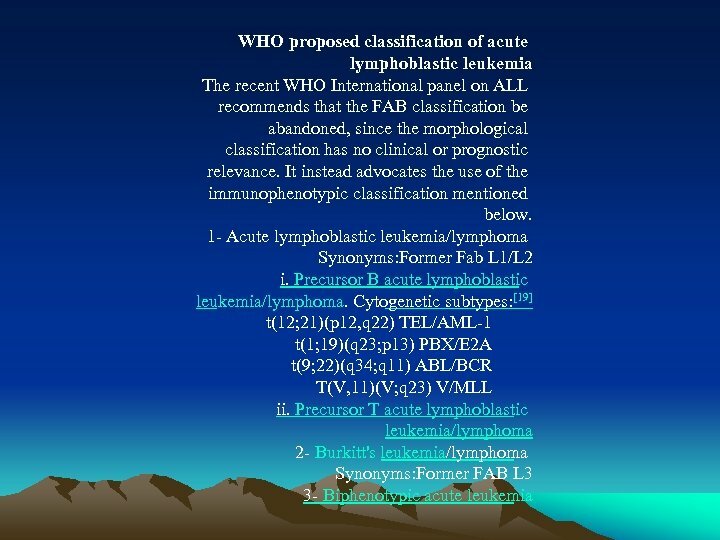 The diagnosis is established by detecting lymphoblastes in the peripheral smear. 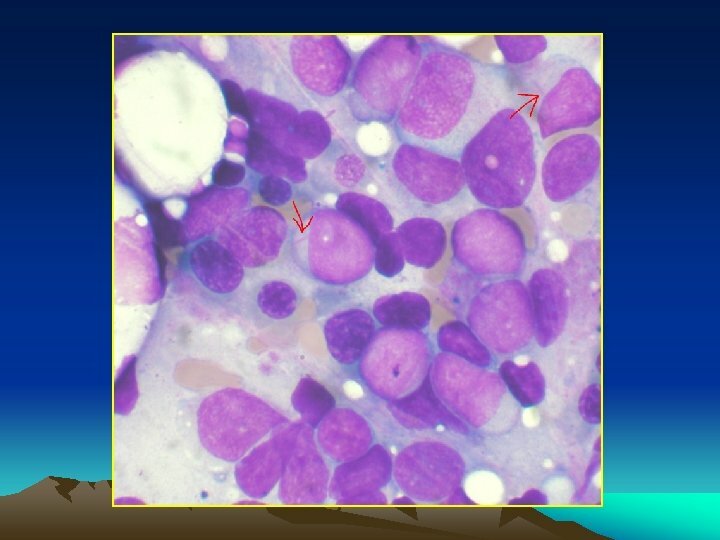 (N. B. Lymphoblastes : large cells with clear cytoplasm, prominant nucleus, definite nucleole. Diff. 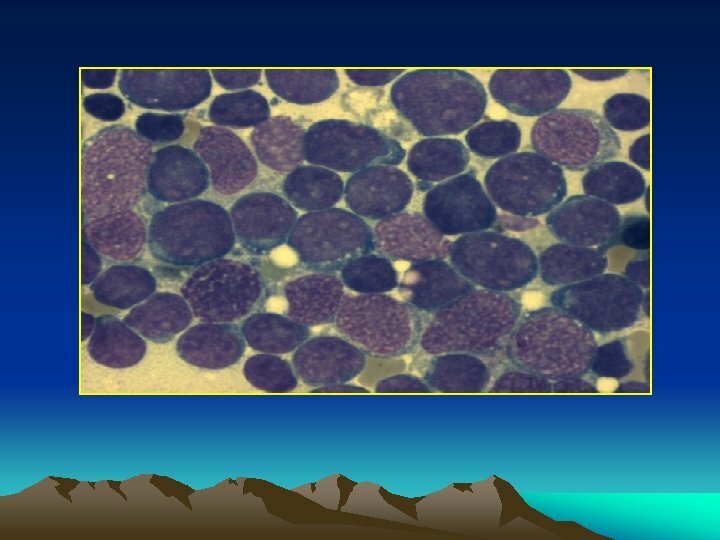 From mycloblastes : absent specific granules of cytoplasm, ve peroxidase stain PAS +ve Sudan Black ve or weekly +ve * platelets : usually < 100. 000 may be completetly absent. 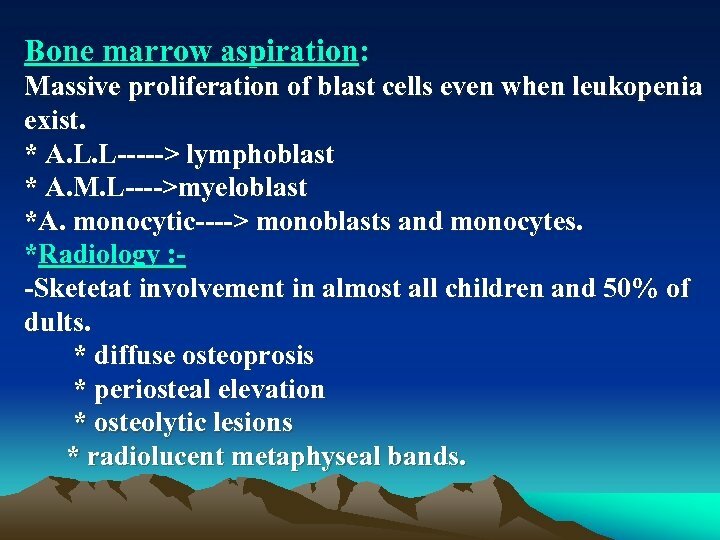 Bone marrow aspiration: Massive proliferation of blast cells even when leukopenia exist. 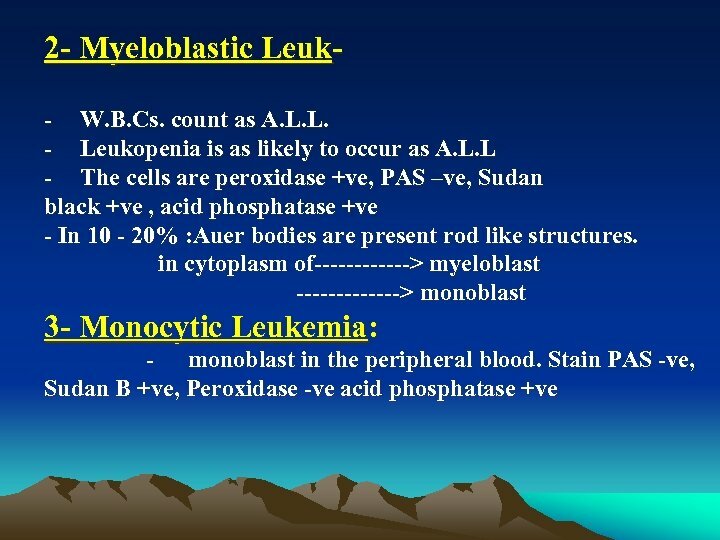 * A. L. L > lymphoblast * A. M. L >myeloblast *A. monocytic > monoblasts and monocytes. 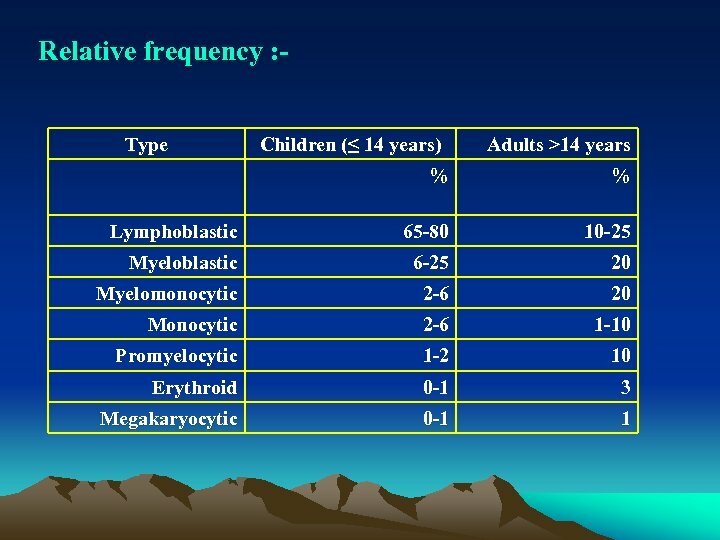 *Radiology : Sketetat involvement in almost all children and 50% of dults. * diffuse osteoprosis * periosteal elevation * osteolytic lesions * radiolucent metaphyseal bands. 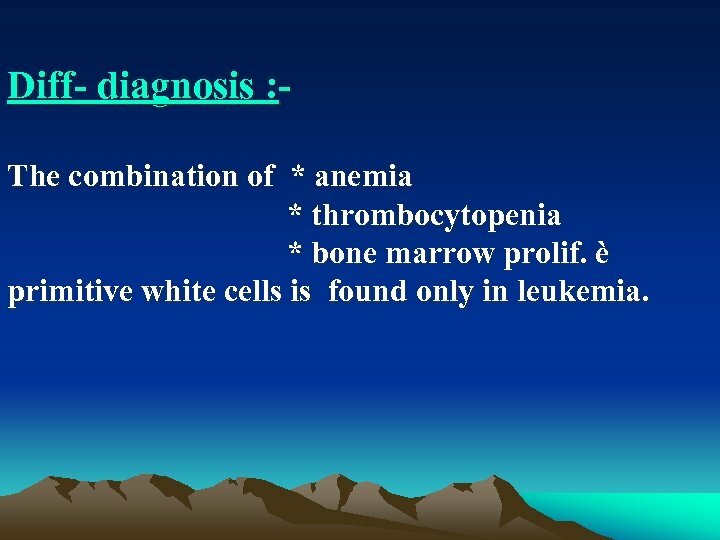 Diff diagnosis : The combination of * anemia * thrombocytopenia * bone marrow prolif. 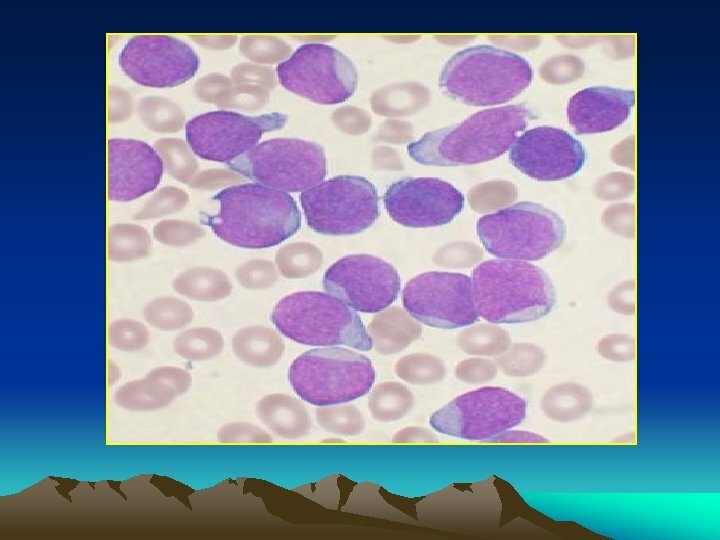 è primitive white cells is found only in leukemia. (1)From other causes of sore throat + Fever as: * vincent angina. *diphtheria. 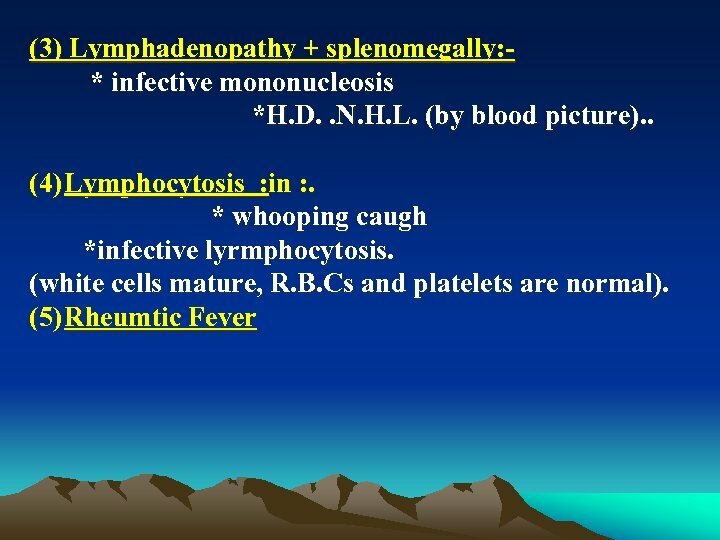 *infectious, mononucleosis. 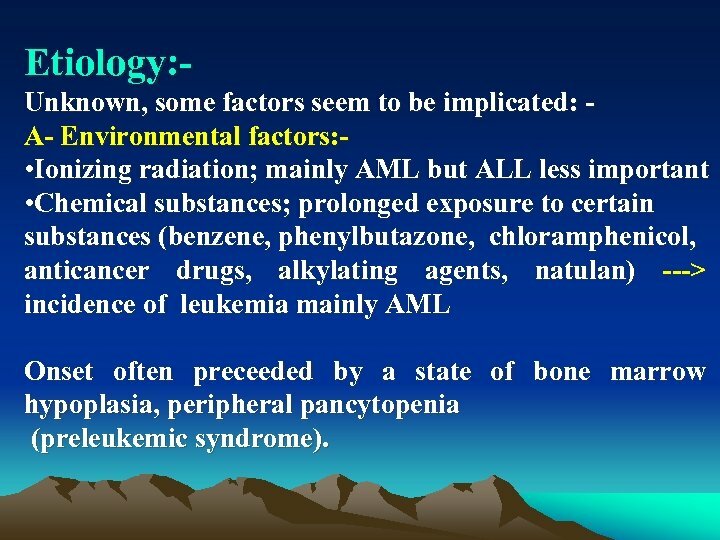 *aplastic anemia. 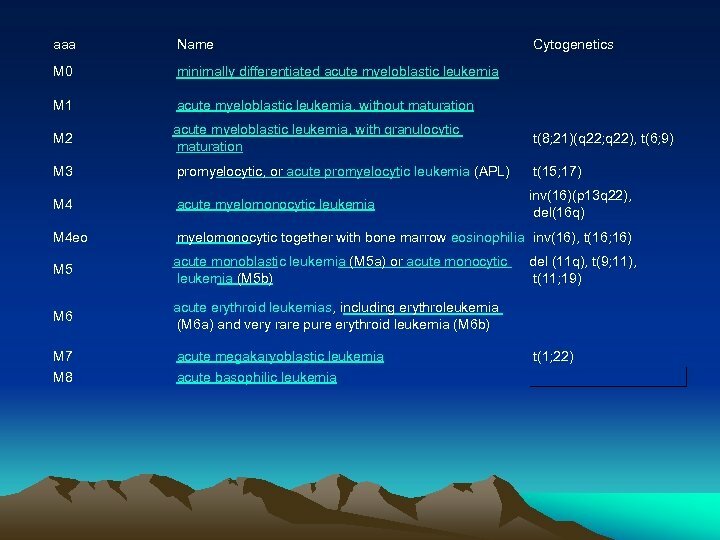 *agranulocytosis. 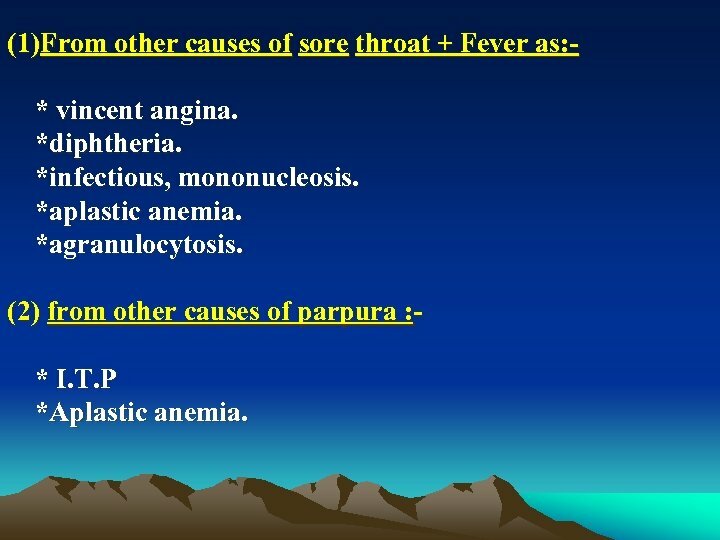 (2) from other causes of parpura : * I. T. P *Aplastic anemia. 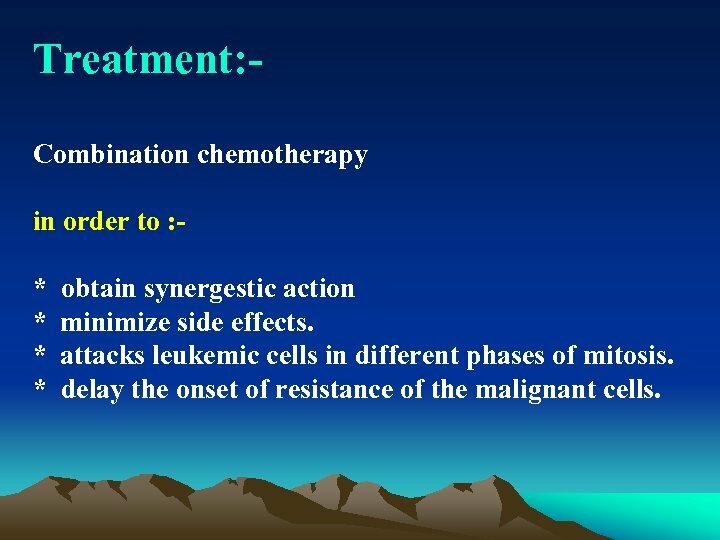 Treatment: Combination chemotherapy in order to : * obtain synergestic action * minimize side effects. 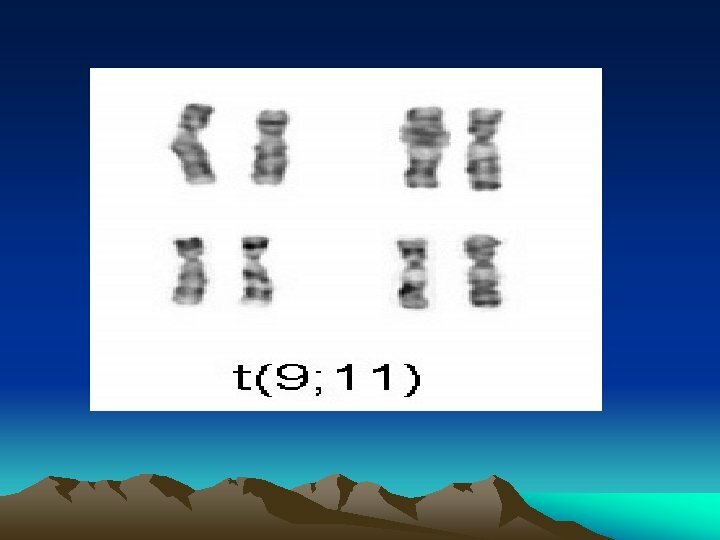 * attacks leukemic cells in different phases of mitosis. * delay the onset of resistance of the malignant cells. 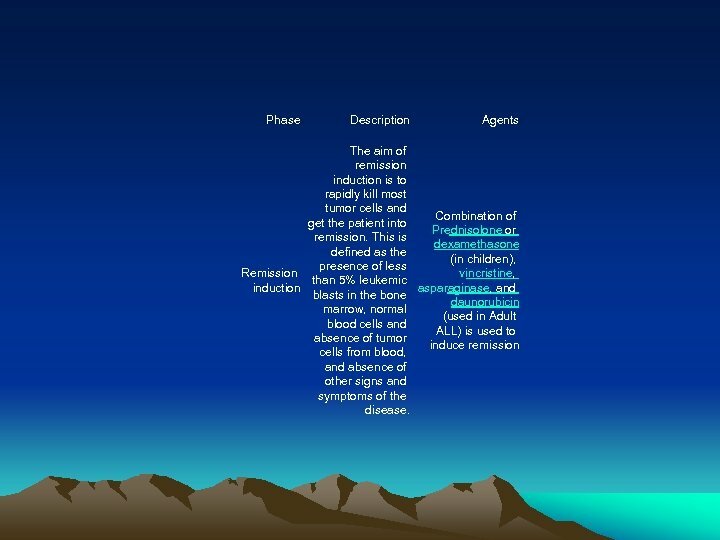 Phase Description Agents The aim of remission induction is to rapidly kill most tumor cells and Combination of get the patient into Prednisolone or remission. 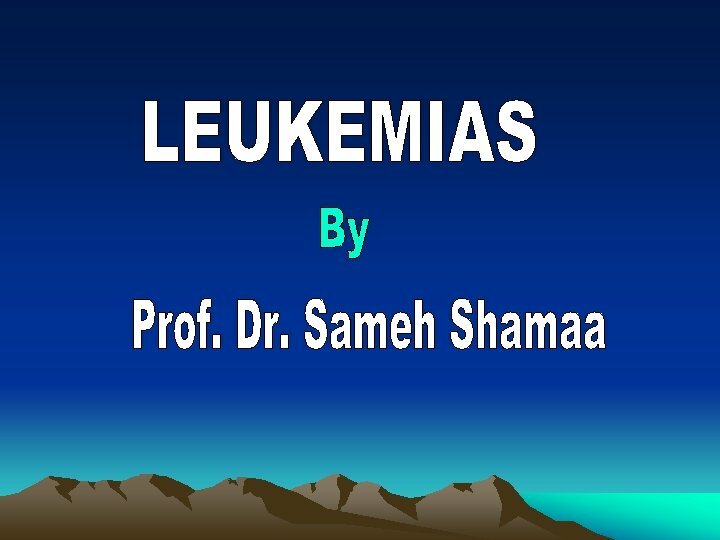 This is dexamethasone defined as the (in children), presence of less vincristine, Remission than 5% leukemic asparaginase, and induction blasts in the bone daunorubicin marrow, normal (used in Adult blood cells and ALL) is used to absence of tumor induce remission cells from blood, and absence of other signs and symptoms of the disease. 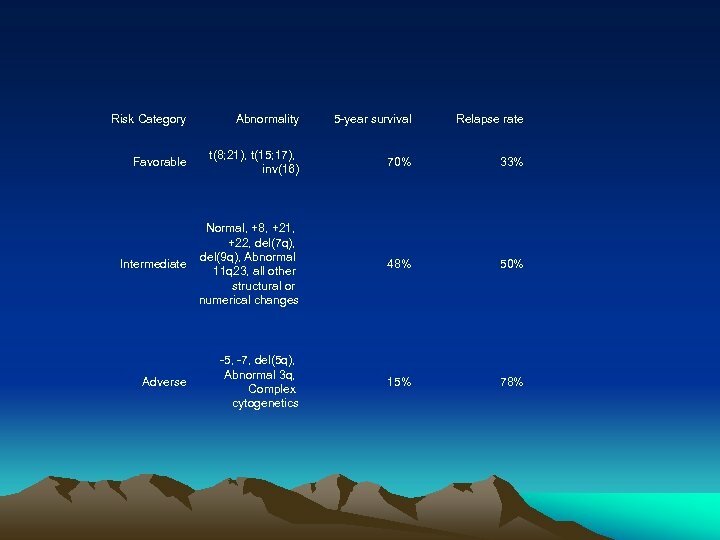 Intensification uses high doses of intravenous multidrug chemotherapy to further reduce tumor burden. 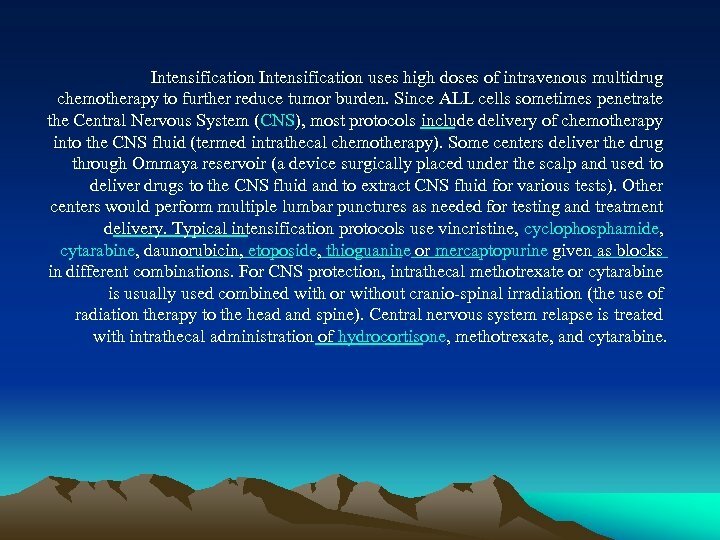 Since ALL cells sometimes penetrate the Central Nervous System (CNS), most protocols include delivery of chemotherapy into the CNS fluid (termed intrathecal chemotherapy). Some centers deliver the drug through Ommaya reservoir (a device surgically placed under the scalp and used to deliver drugs to the CNS fluid and to extract CNS fluid for various tests). Other centers would perform multiple lumbar punctures as needed for testing and treatment delivery. 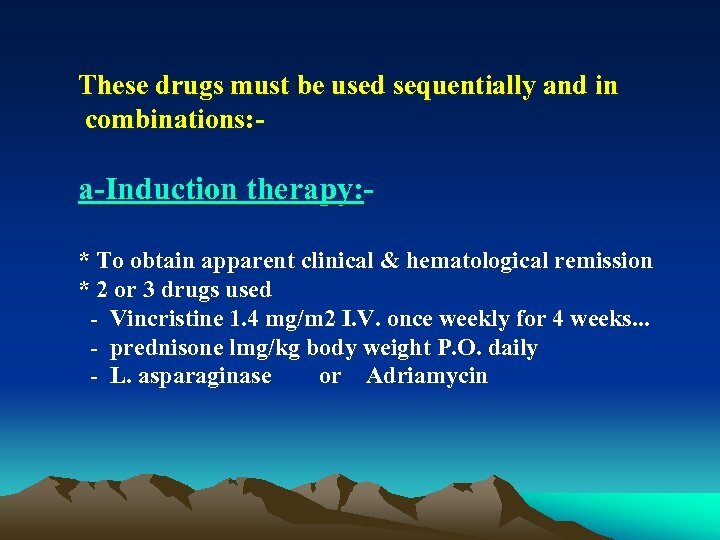 Typical intensification protocols use vincristine, cyclophosphamide, cytarabine, daunorubicin, etoposide, thioguanine or mercaptopurine given as blocks in different combinations. 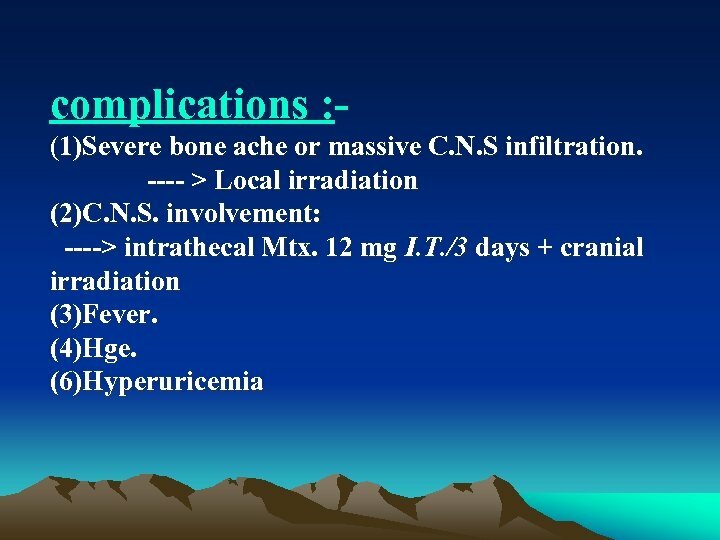 For CNS protection, intrathecal methotrexate or cytarabine is usually used combined with or without cranio-spinal irradiation (the use of radiation therapy to the head and spine). Central nervous system relapse is treated with intrathecal administration of hydrocortisone, methotrexate, and cytarabine. 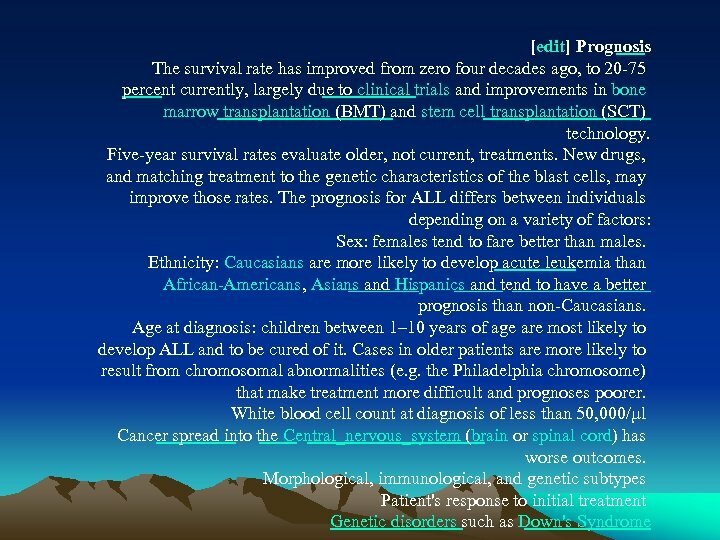 Maintenance therapy The aim of maintenance therapy is to kill any residual cell that was not killed by remission induction, and intensification regimens. 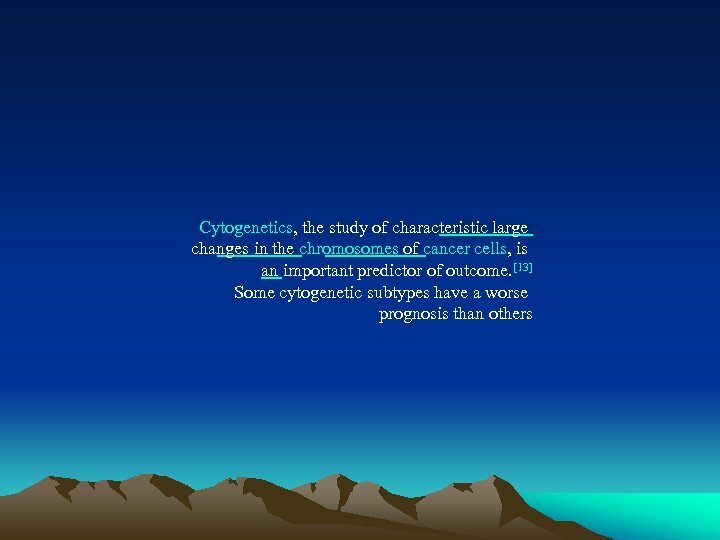 Although such cells are few, they will cause relapse if not eradicated. 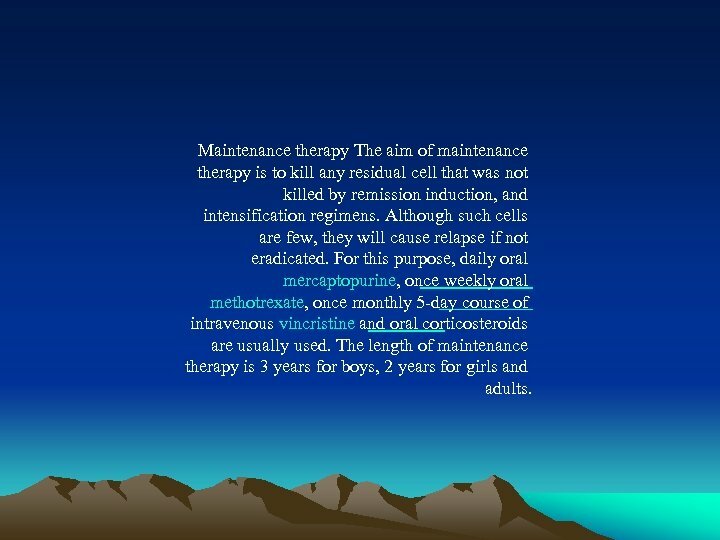 For this purpose, daily oral mercaptopurine, once weekly oral methotrexate, once monthly 5 -day course of intravenous vincristine and oral corticosteroids are usually used. The length of maintenance therapy is 3 years for boys, 2 years for girls and adults. 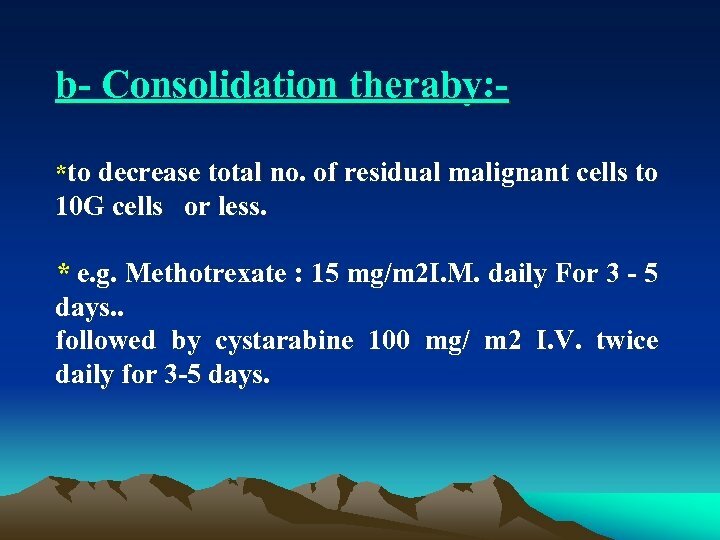 b Consolidation theraby: *to decrease total no. 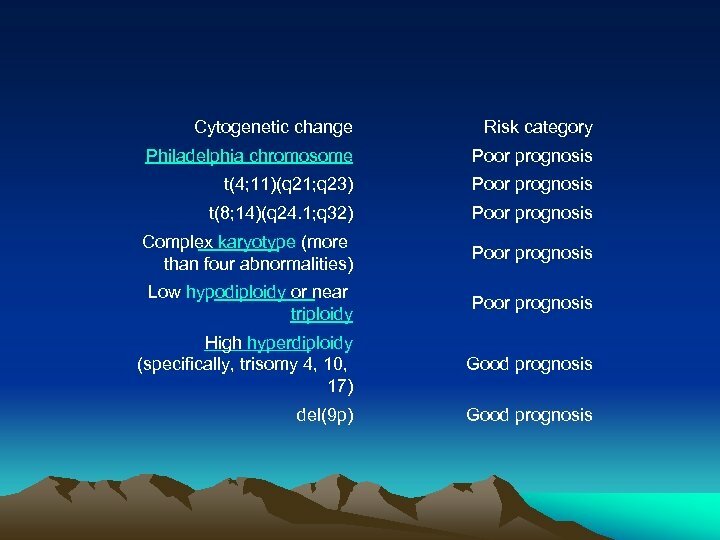 of residual malignant cells to 10 G cells or less. * e. g. Methotrexate : 15 mg/m 2 I. M. daily For 3 5 days. . followed by cystarabine 100 mg/ m 2 I. V. twice daily for 3 5 days. 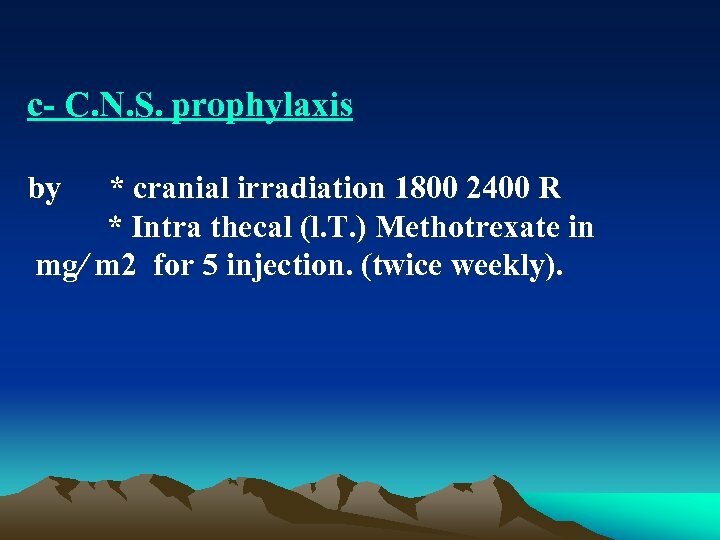 c C. N. S. prophylaxis by * cranial irradiation 1800 2400 R * Intra thecal (l. T. ) Methotrexate in mg/ m 2 for 5 injection. (twice weekly). 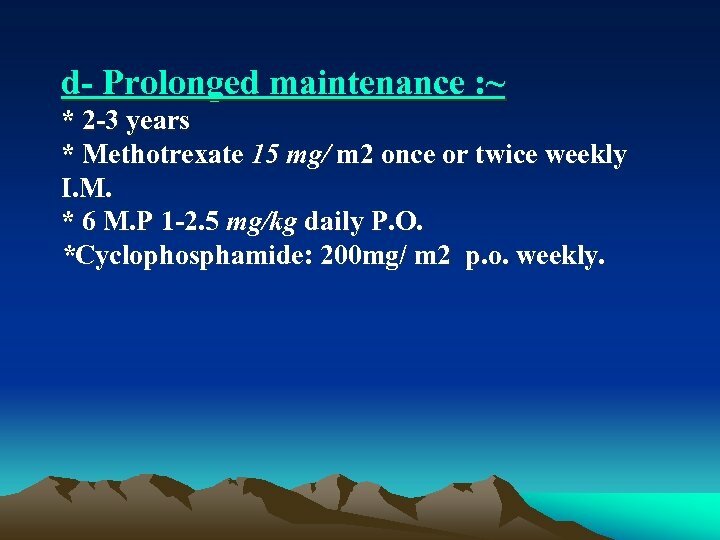 d Prolonged maintenance : ~ * 2 3 years * Methotrexate 15 mg/ m 2 once or twice weekly I. M. * 6 M. P 1 2. 5 mg/kg daily P. O. *Cyclophosphamide: 200 mg/ m 2 p. o. weekly. 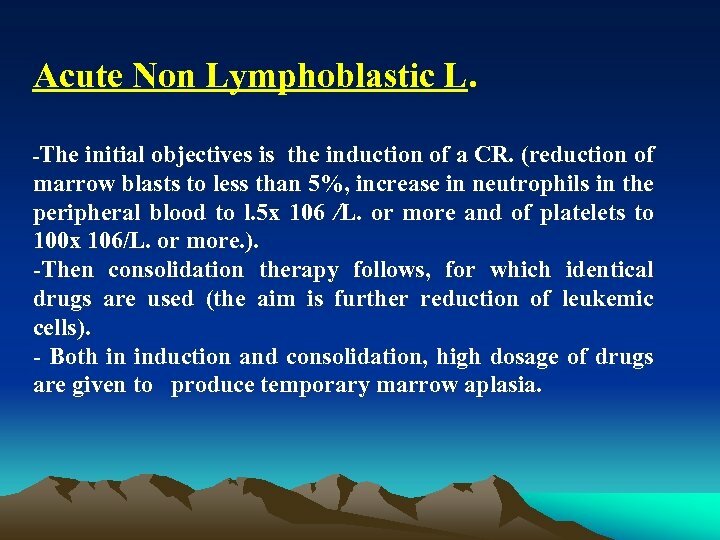 Acute Non Lymphoblastic L. The initial objectives is the induction of a CR. 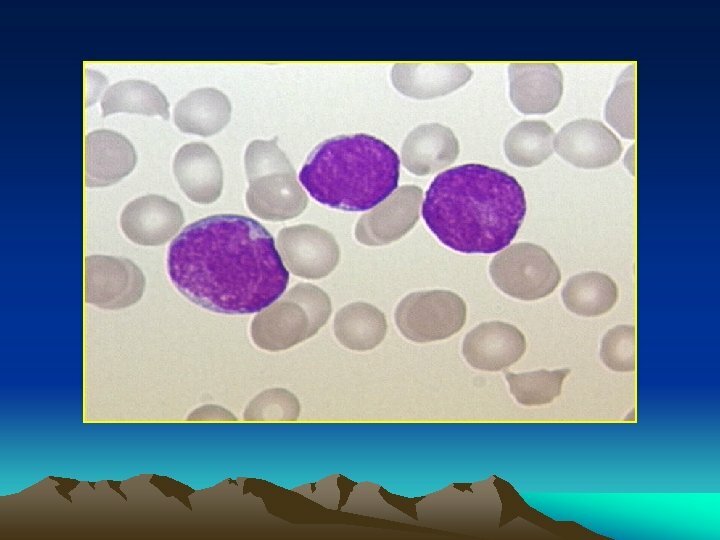 (reduction of marrow blasts to less than 5%, increase in neutrophils in the peripheral blood to l. 5 x 106 /L. or more and of platelets to 100 x 106/L. or more. ). 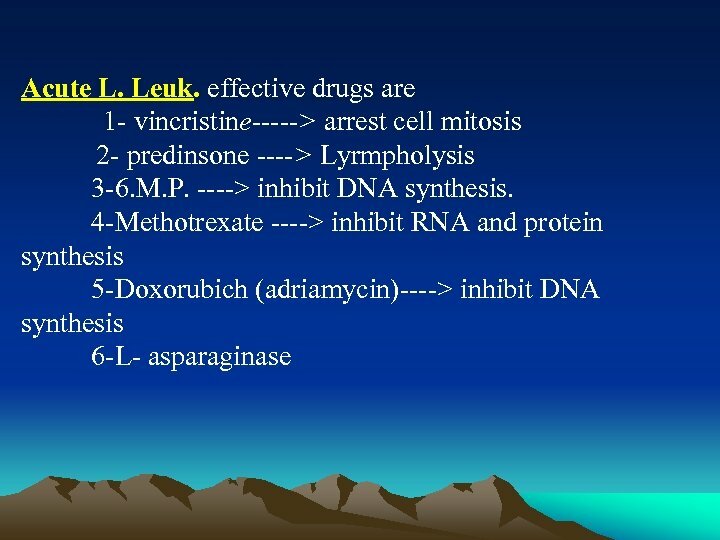 Then consolidation therapy follows, for which identical drugs are used (the aim is further reduction of leukemic cells). 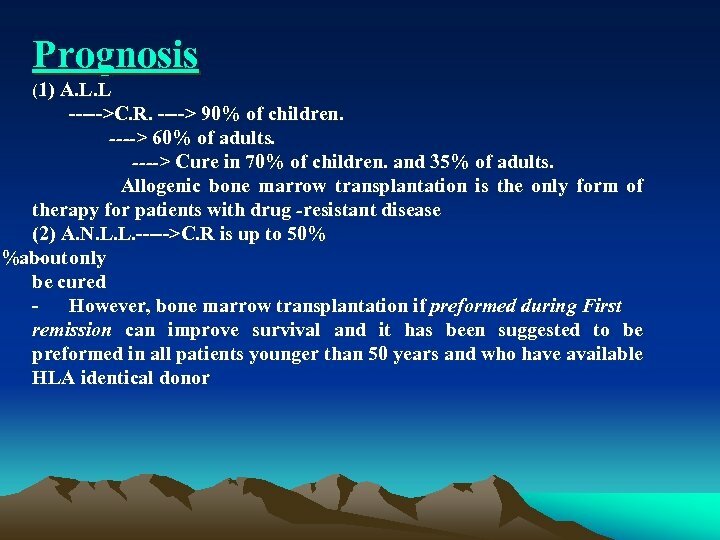 Both in induction and consolidation, high dosage of drugs are given to produce temporary marrow aplasia. 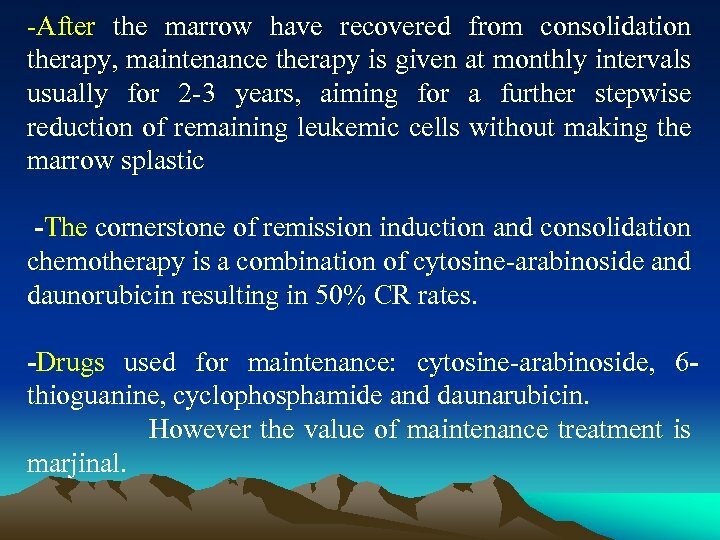 -After the marrow have recovered from consolidation therapy, maintenance therapy is given at monthly intervals usually for 2 -3 years, aiming for a further stepwise reduction of remaining leukemic cells without making the marrow splastic The cornerstone of remission induction and consolidation chemotherapy is a combination of cytosine-arabinoside and daunorubicin resulting in 50% CR rates. Drugs used for maintenance: cytosine-arabinoside, 6 thioguanine, cyclophosphamide and daunarubicin. However the value of maintenance treatment is marjinal.